Media captionRichard Sabin: "We actively use this data for marine conservation purposes now"
It's a curious thing to see a group of early whale foetuses up close - to see beings so small that have the potential to become so big. But what really strikes you, especially in those initial developmental stages, is how familiar the forms look. How like an early human foetus, they appear. 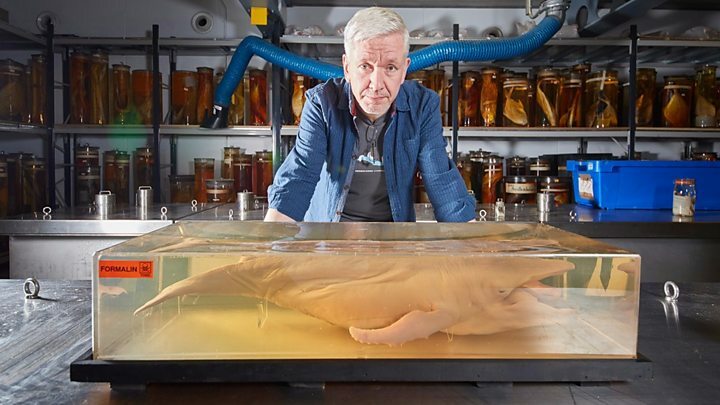 "This is something you see time and time again in vertebrates, not just with mammals," says Richard Sabin, the Natural History Museum's top whale expert. "You see these similarities in the early developmental stages and it's really not until you're halfway through the gestation - which for a humpback whale is around 11 months - that you start to see the things that make that foetus characteristically the species that it is." Richard has a remarkable sequence of seven humpback foetuses that he's going to put on display for the NHM's major summer exhibition on cetaceans. They go from what is essentially just a ball of cells that's perhaps only a few weeks old, all the way through to a specimen that appears to be a perfect humpback in miniature. This larger foetus, about half a metre in length, is probably seven to eight months into the gestation period. It has everything you would expect to see in a humpback, including those long, tell-tale pectoral flippers with their nobbly tubercles. The specimens were collected at the beginning of the 20th Century by scientists who had been sent to the Antarctic to gather data on the activities of the whaling fleets. Their role was to understand the biology, the movements, and the ecology of whales - to appreciate the status of stocks so that the commercial returns could be maximised. It's an awkward feeling knowing that these foetuses were taken from harpooned pregnant humpbacks. Somehow you have to console yourself with the recognition that the acquired data was ultimately what shut down that bloody industry. "There is a story with every specimen and it may not be a very comfortable story, but it is something we have to acknowledge," says Richard. "The thing to remember is that the data we get from these specimens we actively use for marine conservation purposes now." Just this past week, a Swiss-led team used old whaling data to show how species had shrunk in size in the 40 years prior to the stocks collapsing. This trend signal, the team said, could be used to warn of imminent disaster in other hunted wildlife groups. What have we learned from foetuses, specifically? A lot it seems about evolutionary biology. "One thing we see in these humpbacks is the development of tooth buds at around four-to-five months into gestation. They're then reabsorbed to allow the baleen to start to develop," explains Richard. The baleen are the keratin plates that hang from the upper-jaw and filter the humpbacks' prey. "So, we know from the study of these foetuses, from an evolutionary developmental perspective, that there was a time when all cetaceans were toothed and that baleen are a relatively recent development. And we've only just found the fossils that back that up." The whales exhibition is due to open on 14 July, the day after the NHM re-opens its front entrance. The Hintze Hall has been remodelled. Its emblematic diplodocus ("Dippy") dinosaur is being replaced by a blue whale skeleton that will hang from the ceiling (Plot spoiler: I've had a sneak peek already and it looks spectacular). So, it's certainly a timely moment to highlight the contribution of cetaceans to life on Earth. More than 100 specimens from the London museum's collections are being set up in the institution's Waterhouse Gallery. The exhibition will impress upon visitors the huge diversity of whales, dolphins and porpoises. It will explain their relatively short evolutionary journey, from being land animals 50 million years ago to becoming the well-adapted ocean-dwellers we know today. And it will describe how they move, how they breathe, and how some echolocate to find their prey. It still astounds me that whales can communicate over many hundreds of kilometres. "We want people to realise that as well as being mammals like us, they also have complex culture like us," says Richard. "This is a very new area of study that has accelerated in just the past 10 years through observations, through genetic information and the data coming from museum specimens."